Frank Lloyd Wright achieved fame with his Prairie School designs of the late nineteenth century. But by the time he was 67 years old, his career had faded significantly thanks to his own personal scandals - and due to the advent of the Modernists (despite the fact that he had influenced them). So when Wright received a commission to build a home outside Pittsburgh, Pennsylvania in the mid-1930s, he found an opportunity for his style to evolve and to regain his reputation as an innovator. His client was Edgar Kaufmann, who owned the largest department store in Pittsburgh. The Kaufmanns had chosen the property for its natural beauty, and especially for a spectacular waterfall on the site. They expected Wright to place the home with a view of the waterfall. But Wright, seeking harmony between man-made structures and the natural environment, chose to site the home directly atop the waterfall. The result is an astounding accomplishment not only of architecture, but of engineering. Fallingwater dramatically hovers over the water flowing beneath the home, and opens up (via a hatch in the living room floor) to allow occupants to descend a short staircase to the water. Wright also created tiered, cascading terraces that echo the water’s flow. These cantilevered terraces make the home and waterfall one continuous, flowing sculpture. Fallingwater not only embraced the outdoors, it invited nature indoors. A natural rock ledge from the site anchors the hearth in the living room. The home and its furnishings-all designed by Wright-incorporate local materials such as stone quarried on the site, flagstone floors, and extensive wood to echo the natural forms and textures of the surrounding environment. With this unusual design, Wright not only revived his career, he created a masterpiece in organic architecture that changed our perception of how a home could integrate with its environment. 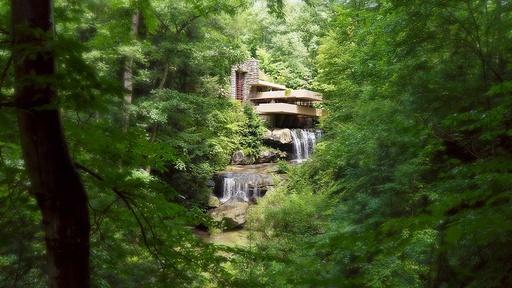 Explore the official Fallingwater site. Learn about Frank Lloyd Wright. Plan a visit to Fallingwater. Fallingwater is an astonishing accomplishment of architecture and engineering.